Native Americans used cranberries as a food and natural remedy to treat bladder or kidney problems. Today, you might take cranberry remedies for the same purposes. You can take cranberry medicinally in the form of juice or tablets, but you should consult with your doctor before taking any cranberry remedy to discuss the proper dosage and potential health risks. Cranberry can help prevent or treat bladder infections, periodontal disease and ulcers, according to the University of Pittsburgh Medical Center. Cranberry might also help in preventing heart disease and cancer. Cranberry is sometimes used as an anti-aging supplement as well, notes the Memorial Sloan-Kettering Cancer Center. You should talk with your physician before taking cranberry to treat or prevent any health condition, however. Cranberries contain powerful antioxidants that protect your body’s cells from damage due to free radicals, says the University of Maryland Medical Center. Cranberries contain proanthocyanidins, constituents that block certain bacteria like E. coli and H. pylori from adhering to your body’s cells. This action accounts for cranberry’s potential for preventing urinary tract infections and stomach ulcers. Cranberry’s constituents might also help to prevent mucous buildup in the urine for certain people, which could reduce the risk of bladder infections, according to the University of Michigan Health System. Cranberry juice has the potential to inhibit certain oral bacteria that are responsible for dental plaque formation and gum disease. Other actions of cranberry include certain anticancer activities against prostate, colon and oral cancer cells. Cranberry tablets are more concentrated than cranberry juice, which indicates that the tablets would theoretically provide enhanced benefits. But because the tablets are more concentrated, taking them could increase your risks of certain health dangers. Cranberry tablets could increase your risk of developing kidney stones if you take them for long periods of time. A drawback to cranberry juice is that it often contains large amounts of sugar or sweeteners, which could pose health risks for certain people. For example, people with diabetes shouldn’t consume large amounts of cranberry juice that contains sugar. Finally, taking cranberry tablets might be slightly more cost-effective than cranberry juice. You might take 300 to 400 mg of cranberry extract tablets twice daily, according to the University of Pittsburgh Medical Center. If you’re taking the juice, the typical recommended dosage is drinking 8 to 16 ounces of pure cranberry juice each day. Recommended dosages of cranberry juice or tablets can vary slightly, however, so you should ask your doctor about the dosage that’s right for you. A double-blind clinical trial involving women with recurrent urinary tract infections found that taking 400 mg of cranberry tablets each day substantially decreased the frequency of recurrent infections over the course of three months. The study was published in the "Journal of Family Practice" in 1997, notes the University of Michigan Health System. 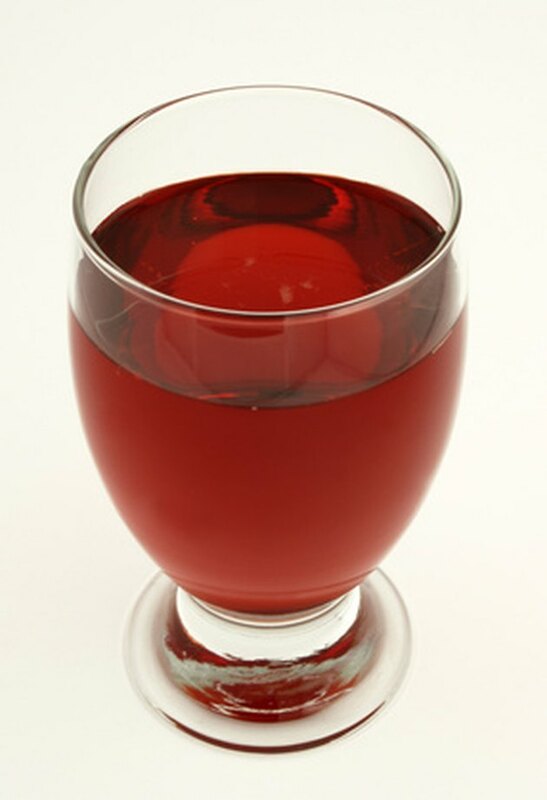 A one-year-long, double-blind study of 150 women compared the efficacy of cranberry juice to cranberry tablets in preventing bladder infections. Published in the "Canadian Journal of Urology" in 2002, the study found that taking cranberry tablets or 8 ounces of cranberry juice three times daily were equally effective in reducing the frequency of bladder infections, notes the University of Pittsburgh Medical Center. A 2005 three-month-long, double-blind study conducted in China found that drinking cranberry juice substantially decreased the amount of the ulcer-causing H. pylori bacteria in the stomach. A 2004 study published in "FEMS Microbiology Letters" and a 1998 study in the "Journal of the American Dental Association" determined that cranberry juice effectively inhibited oral bacteria related to dental plaque and gum disease. Although cranberries are considered safe due to their use as a food, taking the juice or tablets could pose certain health risks for some people. Cranberry juice or tablets could decrease the effectiveness of weakly alkaline drugs like antidepressants and certain painkillers. Cranberry could also increase the effects of “blood-thinning” medications like Coumadin, which might cause excessive bleeding. Because cranberry juice and tablets contain large amounts of oxalate chemicals, they might increase your risk of kidney stones. Talk with your doctor before taking cranberry tablets or drinking large amounts of the juice if you take any of these medications or are prone to kidney stones. What Are the Benefits of Cranberry Concentrate?